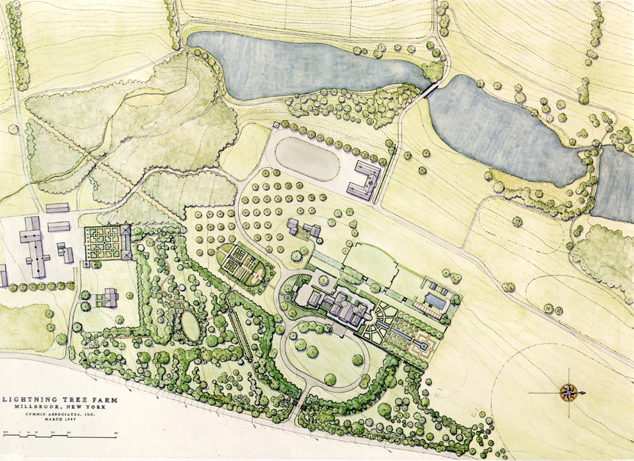 The landscape planning for Lightning Tree Farm sought to connect and relate diverse elements of the existing landscape through the introduction of significant spaces, elements, and circulation patterns. In its role as a “gentleperson’s farm” and weekend retreat, the aesthetics of the landscape—the natural beauty of the land and the created beauty of the gardens—were the owner’s first priority. The importance of ecological and agricultural systems on and surrounding this large property were also clearly acknowledged. The master plan provides for the easy coexistence of domestic, recreational, equestrian and farm uses through the re-organization of functions and movement through the property.